Forget the new PS4 Slim or the Xbox One S, the best-selling game console deal this Black Friday was the New 3DS from Nintendo. By a long shot, we saw more of those sold through retailers like Amazon, Best Buy and more than any piece of gaming hardware. 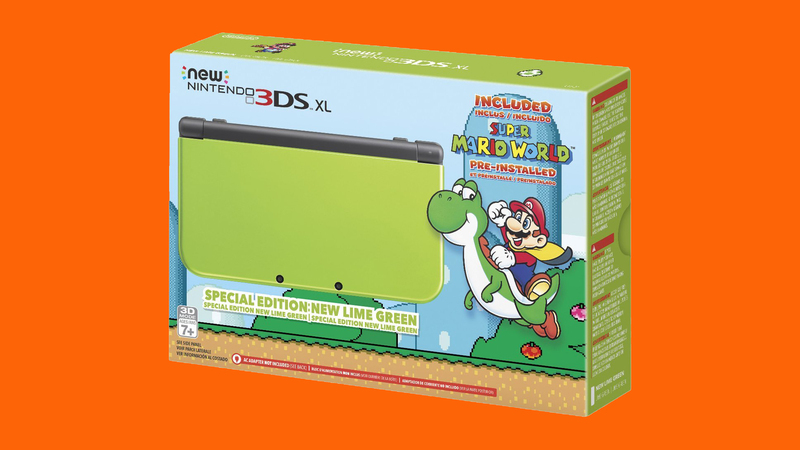 Amazon, Best Buy, Target and GameStop were a huge help in that, with their special edition, $99 New 3DS XL deals . However, many are frustrated with how Amazon allowed for pre-orders two days in advance – and then sold it outright one day in advance – all without making any of that clear to its wide base of customers. Regardless, as of this writing, Amazon is still the best place to buy a New Nintendo 3DS XL – the operative word here being “New”. That’s because it’s selling an exclusive lime green version of the console with SNES classic Super Mario World installed for just $199 on the Amazon website. That’s far less than any other major US retailer is selling New 3DS XL bundles for, with those going for beyond $250. That said, you may have a chance at a sick, sub-$200 3DS yet. In our scouring of the internet, we found that Target appears to still be listing a New Nintendo 3DS (note the lack of “XL”) bundle with Super Mario 3D World installed for just $149 on its website for in-store purchase. Warning: it wasn’t readily available in our area, as it’s a store pickup deal from Target – but, you might get lucky! Target also appears to be coming through still on the $99 New Nintendo 3DS deal both in black and white, but again, only in stores. Finally, the absolute cheapest way to get a loved one into the vast library of modern Nintendo 3DS handheld games is to drop the 3D altogether. We found that GameStop is still selling both blue and red Nintendo 2DS consoles with Mario Kart 7 installed for just $79 on its website. This version of the console has no 3D, but it can play any Nintendo 3DS game just the same. Would a privately-owned Tesla be better off?